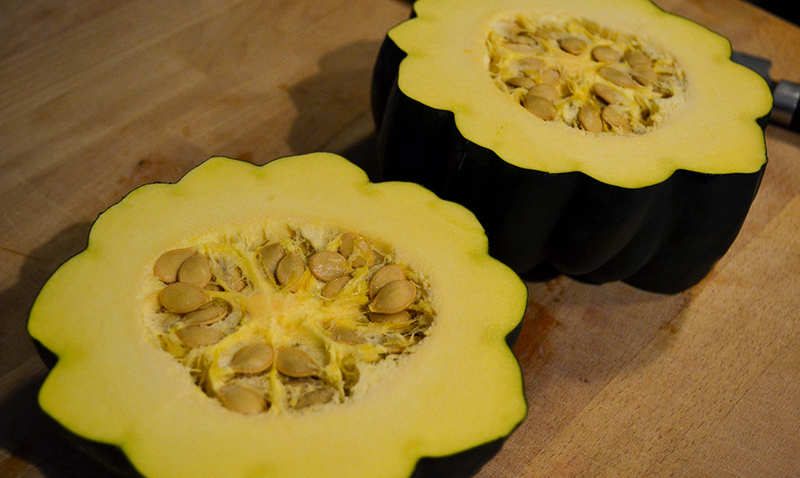 We have been on a mission to buy, try, and cook all of the different types of squashes for a while now. Jonathan and I are a huge fan of the low-carb lifestyle when cooking for ourselves at home (and let’s be honest, it’s tough to be low-carb and eat out!) 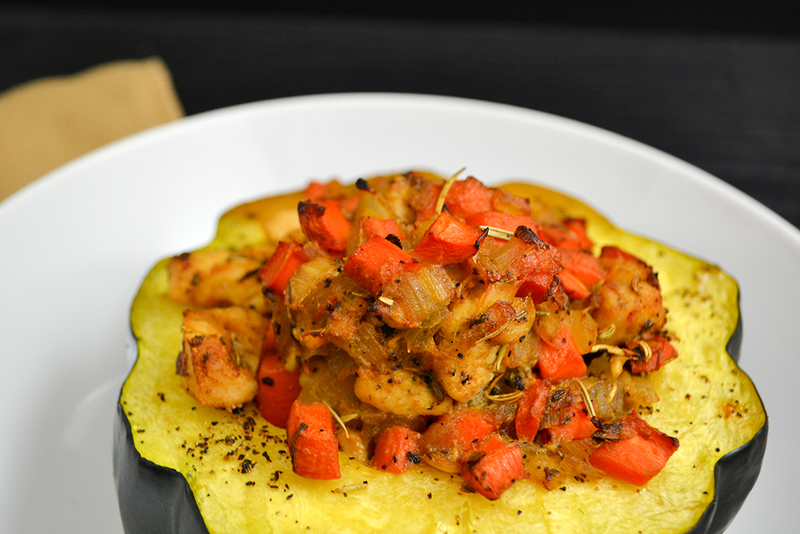 So we have conquered Butternut Squash for some time now (and love it!) but I’ve never attempted an acorn squash. I decided the best way to find a recipe for something new is pinterest, so I set out to find a way to use this awkward shaped veggie. 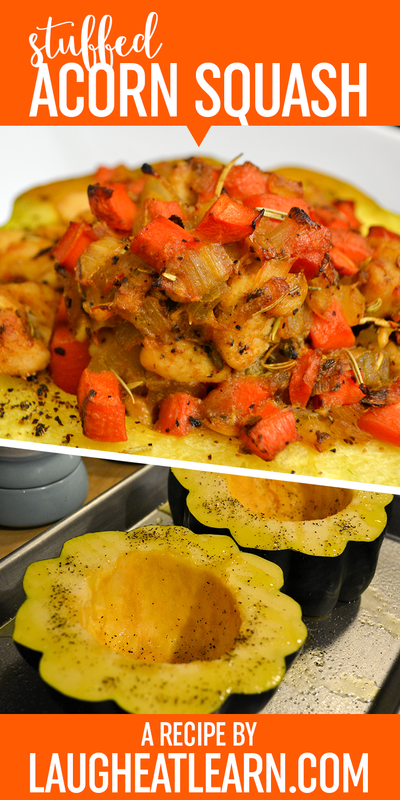 Looking for a fall inspired meal? Pin it to save! I found a lot of holiday theme recipes, especially ones with stuffed squash with leftover turkey. Being as it’s mid-October, I didn’t have any turkey on hand, but had chicken ready to go. I tweaked the recipe to have more of an Italian feel, with the different spices. With how beautiful this turns out, we decided to make it for a dinner party this week and was great success (and I had the kitchen cleaned up before the guests even arrived!) My favorite description of the meal was that it almost tasted like a deconstructed chicken noodle soup with the tenderness of the chicken, squash, and the cooking juices throughout the stuffing mixture. This is by far one of my favorite recipes to enjoy now at home on a crisp autumn night! Begin with the acorn, cutting the top and end off of eat. Slice down the middle to create two bowls. Using a spoon, scrap the seeds out of the center and discard. Place the acorns on a cookie sheet (bowl side up), drizzle with about 1-1½ tablespoon olive oil on the top and in the center. Sprinkle with a good amount of salt and pepper. Bake the acorns for 20 minutes. 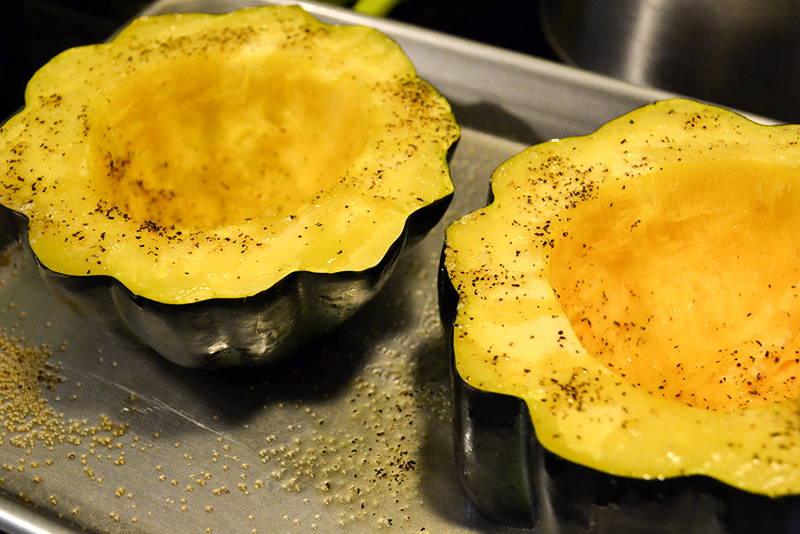 While the squash cooks, heat the remaining olive oil in a deep pan on medium high heat. Add the onions with a little salt and pepper. Stir and cook for 5 minutes to soften the onions. Add the carrots to the mixture, stir and cook for additional 5 minutes. Add the garlic, diced chicken and all the seasoning to the mixture. Continue to cook on medium high for an additional 5 minutes or until chicken is cooked through. Remove the mixture from heat and add to a bowl. Add the egg to the mixture and stir together. Remove the acorns from the oven and scoop the chicken mixture into each bowl, pressing it down into the center. Bake the stuffed acorns at 400 degrees for an additional 20 minutes. Remove from the oven. Carefully using a spatula and tongs, move the stuffed acorn to your favorite plate, grab a fork and ENJOY! This recipe is the perfect amount for two. Simply double the recipe to serve a crowd. You can also easily switch out chicken for leftover Turkey for the perfect day after Thanksgiving meal.